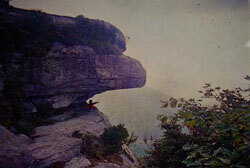 The great peak named Caesar's Head dominates the landscape in the northwest corner of Greenville County. Located along the border between North and South Carolina, the mountain was revered by the Cherokee, and its wooded slopes became the source of timber and recreation for South Carolinians in the nineteenth and twentieth centuries. Postcard view, around 1910." Courtesy of the South Caroliniana Library. To better understand the process read through all the stages before linking to the web pages or beginning your work. Explore the web links below and answer the questions provided on this worksheet . In this exercise, you will read about the Allendale expedition, a volunteer field program in South Carolina, and learn more about the native Americans who lived in South Carolina. 1. Visit the Allendale web site 2006 Allendale Expedition. Answer the following questions on the worksheet. 2. Next, go to the SCIWay web site and read about the seven Indian tribes that are still present in South Carolina or their descendants. South Carolina Indians, Native Americans. Compare the different tribes by completing the chart. The final stage of this project is to take what you have learned and write a story about what you would think daily life in an Indian town would be like. Select from one of the tribes that exists in South Carolina today. The story should read as realistic fiction and be at minimum of two pages in length. 1. Check out the web sources that are linked on the SCIWay web site. Each tribe has several web site links with additional information. South Carolina Indians, Native Americans. 2. View the illustrations of Indian life located at the History of South Carolina Collection and read the narrative descriptions. South Carolina Indians, Native Americans.